One of the largest structural firms in Las Vegas, Lochsa Engineering, and Las Vegan architect Mark Ross Johnson helped with the attraction. Las Vegas based consultants included an engineering consultant who studied the wind activity and the geologist who studied the rock. Manual Mojicar founded Executive Construction the general contractor of the job. Executive Construction also includes two other business partners with more than 50 years of experience in the building market. The Skywalk is a $30 million real estate investor funded venture to serve as the Grand Canyon West centerpiece, a Hualapi Reservation tourist destination. Grand Canyon West offers rides by horseback, pontoon, helicopter and off road vehicle around and in the canyon. The Skywalk admission is expected to cost $25 to walk out on the 4 inches of glass floor of the walkway. 100 mph wind gusts were designed into the attraction’s ability to withstand. A private opening will be March 20, 2007 with Edwin “Buzz” Aldrin, Apollo astronaut. He was the second man on the moon and will be the first to walk the Skywalk. Call 702-505-6988 for VIP Las Vegas homes search by a Las Vegas real estate agent. 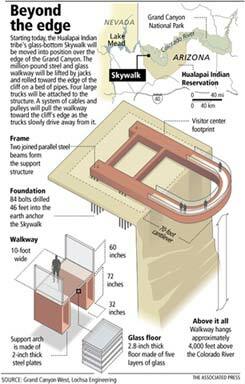 Skywalk walkway at the Grand Canyon hovers visitors 4,000 feet in the air.